We needed to do something to help protect little man from hitting his head too hard on our coffee table. I understand that kids hit their heads and they will get hurt. But, I don’t want to see him get hurt on the edges. So, on one of our family walks, we stopped at the hardware store and got some pipe insulation (3/4″). Little man loved playing with it on the walk home. Once we were back, we split the insulation down the seam and had it cup over the edge of the coffee table. Then we taped the ends together with some black electrical tape. 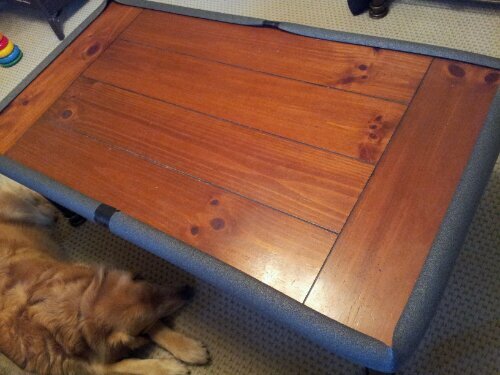 Now we have a baby proofed coffee table. So far so good! The only downside is that little man still wants to play with the foam pipe insulation.